Ubu Roi first opened in 1896 in Paris and caused a scandal. A surreal reimagining of Macbeth, Ma Ubu convinces her husband Pa Ubu to take the throne of Poland by force. The staging of this performance really celebrates the absurd: the imaginative props give the play a gleeful childishness, even though what they're representing isn't always clear. Chaos and confusion reign on high, incorporating everything from briefcase dogs, to wind up teeth. The intention of the play was always to defy theatrical norms. 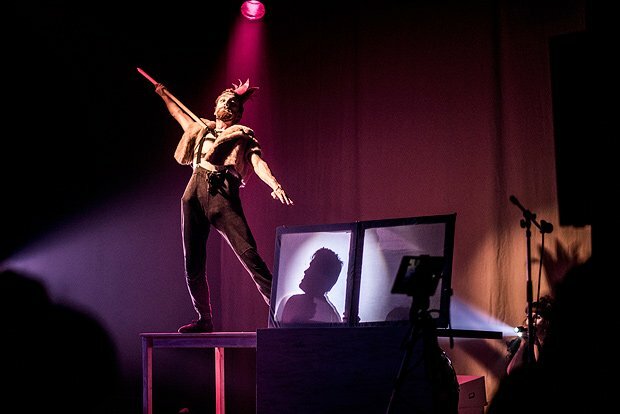 But over a century on from its original performance, its power to shock theatre goers is somewhat diluted, and the addition of an Ubu Pad (definitely not an iPad) isn't enough to bring this play into the 21st century. The troupe of four do well to perform with such energy and all possess something of a John Cleese-physicality. Their exertions leave their painted faces running by the end. But as the audience grows increasingly confused, and lines become more difficult to decipher, the play falls a little flat. Despite this there are definitely laughs to be had, and considering the similarities of Pa Ubu to current political leaders, perhaps the madness and chaos isn't so irrelevant.